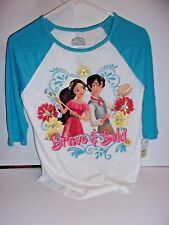 Very Hard to find major unicorn Disneys Snow White and the Seven Dwarfs hi lo tunic shirt like the kids version of the Irma Lularoe Disney Gracie Size 10 Kids Seven Dwarfs Top From Snow White New NWT. Condition is New with tags. Shipped with tracking from a smoke free odor free clean home. Thanks for looking! Miss Chievous Girls' Sequin Reindeer 3/4 Sleeve Brushed Hacci HiLo Tunic Top The raglan sleeve begins at the neck, and has a long seam line from the neck to the armhole, giving this tunic an undefined shoulder. JUSTICE GIRLS SIZE 12 REVERSIBLE SEQUIN MERMAID TOP NEW WITH TAGS, VERY CUTE! New NWT Nike Girls 3/4 Sleeve Top Sz M Medium *PET AND SMOKE FREE HOME * 100% AUTHENTIC BRAND NEW UNWORN ITEM!!! I DO NOT BUY OR SELL FAKES NOR REPLICAS SO YOU CAN BUY WITH CONFIDENCE! PAYMENT IS DUE WITHIN ONE HOUR OF PURCHASE NO RETURNS NOT RESPONSIBLE FOR FLAWS, FACTORY DEFECTS, OR IMPERFECTIONS ALL SALES FINAL!!! US SHIPPING ONLY TO THE MAIN 48 STATES! CHECK MY OTHER LISTINGS FOR OTHER NIKE PRODUCTS! THANK YOU FOR VIEWING!!! Adorable Gap swim shirt never worn. Size 10 but seems to run a little small. Sleeve: 60% Cotton, 40% Polyester. Length: 19" in. Width (armpit to armpit): 14" in. Fabulous flip sequin graphic. Comfy tee that's ready for practice. Inspired by her favorite sport. Flippy fun for active girls. Size 1 4-16. LOT OF 2 UNDER ARMOUR HEATGEAR 3/4 SLEEVE V-NECK SHIRTS, BOTH ARE GIRLS TAG SIZE SMALL, BOTH ARE LOOSE FIT STYLE, CITRUS BLAST AND TRUE GRAY HEATHER COLORS, BRAND NEW W/ TAGS ATTACHED, BOTTOM PORTION OF TAGS CUT OFF AND LIGHT WEAR ON TAGS FROM STORAGE BUT BRAND NEW OTHERWISE, PLEASE SEE LISTING DESCRIPTION FOR ALL PICTURES AND DETAILS!!. Super cute shirt, and not too much Halloween style, could be worn year round! 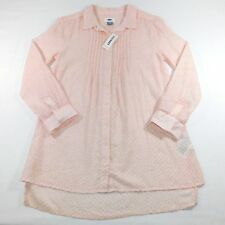 This Sloan LuLuRoe shirt is brand new with tags. It is a dark grey color with blue sleeves with a shape pattern. It is very soft. 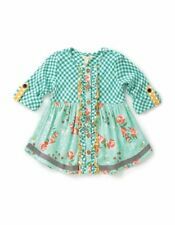 Osh Kosh B’Gosh Girls Shirt. • 3/4 Length Sleeves. 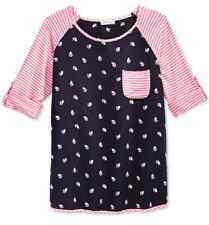 NWT Girls Matilda Jane Paint by Numbers Sky View Puffer Tee top size 10. Condition is New with tags. Shipped with USPS First Class Package. Reversible Sequin Unicorn - Aqua Blue on one side and a Darker Aqua Blue on the reverse side. Shoulder to Bottom - 25". Opened at the very top of the back. Shoulder to Bottom - 26 1/2". Monteau brings delightful fun to her casual look with this super-comfy babydoll top showcasing crisp plaid and pretty lace detailing at the shoulders. Lace detail at shoulders. Contrasting Peter Pan collar with back button closure. Sticker Raglan Tee. Comfy raglan tee. Machine wash cold. 60% Cotton / 40% Polyester. On-trend high low hem. Stadium style with a so-fun spin. Levi's Girls. Button Up Shirt. 3/4 Sleeve. Gray with Colorful graphic and Stars on sleeves. Fits Size 10-12 Large. We will work our hardest to resolve the problem for you. Don't know if it will fit?. Justice Girls Black Embellished Horse Lover Top. floral and horse print. This is more like a thin lightweight sweater. Machine Wash. Turn inside out, machine wash cold, gentle cycle, only non-chlorine bleach when needed, tumble dry low, cool iron if needed. Girls Size Small. NWT LuLaRoe Kids Girls Mint Coral And Gray Geometric Sloan Tee T-Shirt Sz 4. Condition is New with tags. Shipped with USPS First Class Package. Black and Purple. Fits Size 10-12 Large. 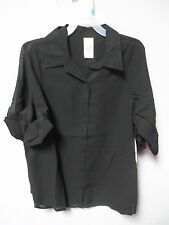 Faded Glory Youth Girls Black Blouse 3/4 Sleeve Shirt. Size XL (14/16). 100% polyester. Wear with a cami. LOT OF TWO (2). We will take care of the problem quickly and give a fair response.